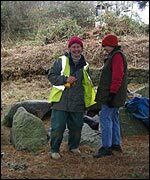 With the revamp of Delancey Park in early 2009 the Guernsey Museum service investigated the Neolithic passage grave that exists in the park. Guernsey is littered with Neolithic relics, many in the form of passage graves such as the Dehus and Trepieds tombs. Another such structure exists at Delancey Park and was only discovered in the early 20th Century. 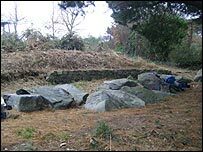 According to Guernsey Museum's archaeology officer Phillip de Jersey the grave was "poked at" in the 1930s but had never been investigated thoroughly and so the clearance of the area was "an ideal opportunity to have a proper look". Over the years the site has been damaged with the capstones being removed and the upright pillars collapsing in on themselves, however, Phillip said they may have covered over some "pockets of interest" and left them undamaged by other interference. Guernsey's Neolithic graves are around 5000 years old and represent early examples of their style providing a valuable insight into the island's early settlers. Phillip said, "We don't get the opportunity to dig a structure like this very often" and so the team of museum volunteers were very much looking forward to the job.